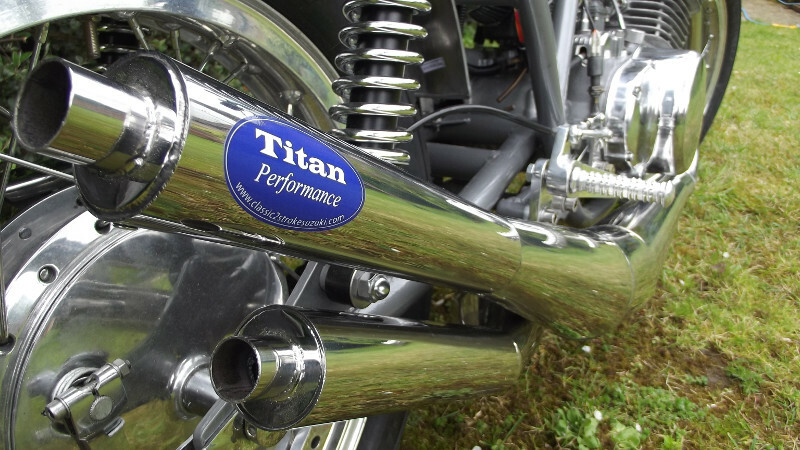 Paul Courbot of Titan Performance rebuilds the T500 he’s owned since age 19! 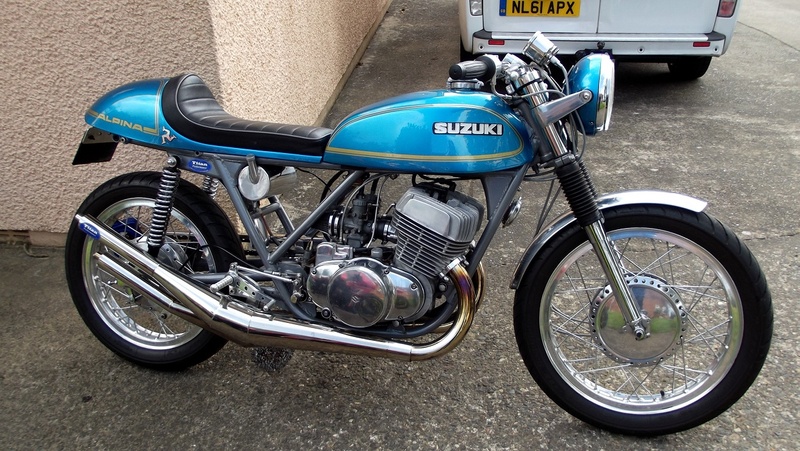 Enter Paul Courbot of Titan Performance — located in Ramsgate, Kent — who bought his first Suzuki T500 in 1977, at the age of just 19. 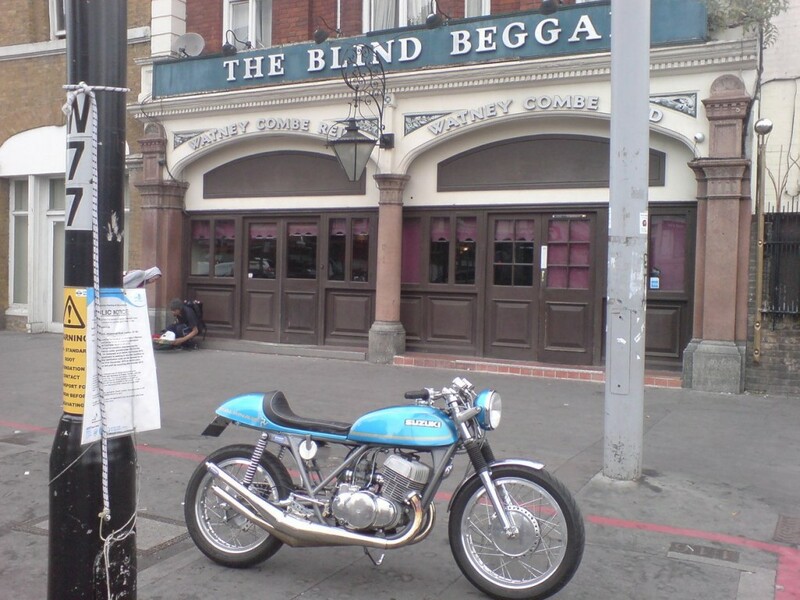 When the bike was hit by a car, Paul repaired the bike to original condition and used the insurance money to build a cafe racer out of the replacement bike. Fast forward some four decades, and Paul still owns both T500 machines! Below, we get the full story on this stunning build. I started riding in 1975 when I was 17. 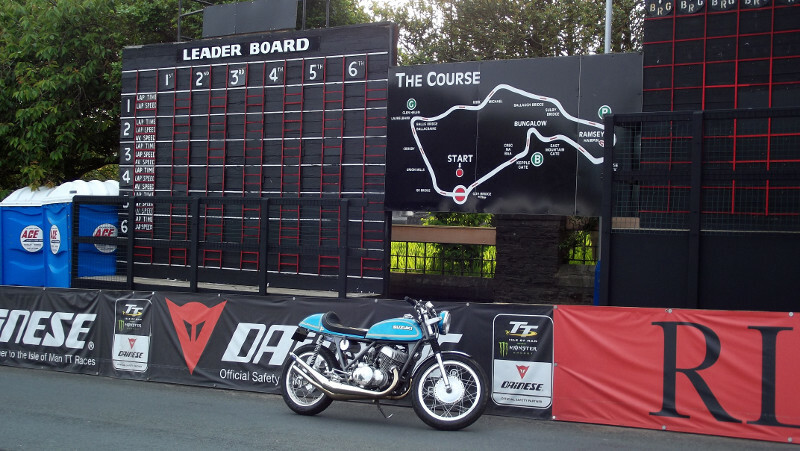 The seventies were full of 2 strokes….4 strokes were just not on my radar. 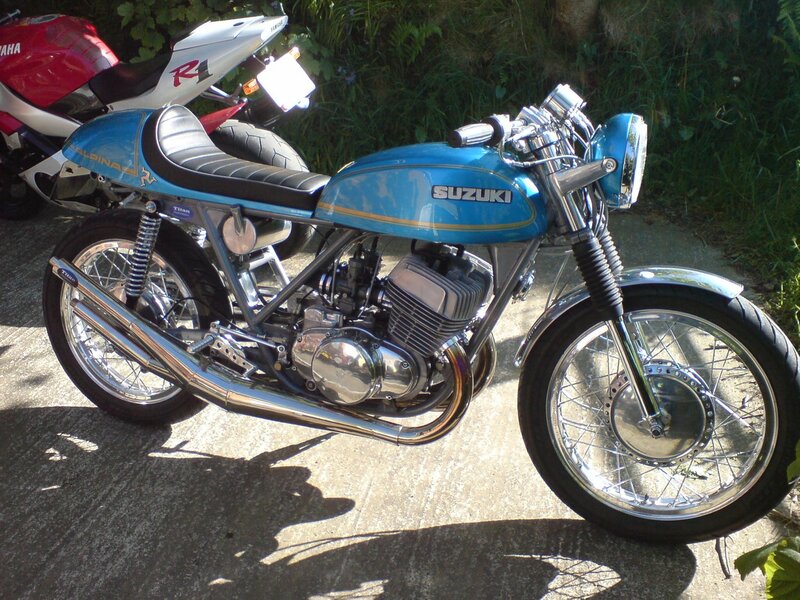 I started with a Yam YB100 and by ’77 had progressed to the T500. Sadly, the bike was hit by a car while parked just a few weeks after I bought it, and written off. I bought another T500 with the money, and got the damaged one back from the insurer for just 30 quid. I made a café racer of the second one, (which I still have also), and repaired the original keeping it standard. I was lucky enough to be able to buy bigger and better bikes without the need to part with the 500s…which I particularly liked. I have had many bikes, which were mainly litre plus machines from the early 80s to date, and still own an R1 and a Kettle as well as the two T500s today. The bike had been very neglected for a number of years, and was sat on a bench in my pal’s workshop being used as a test mule for new parts we were experimenting with. It seemed ironic that I was helping others make their machines look good, when my own was a mess….so in 2014, I decided to put that right. 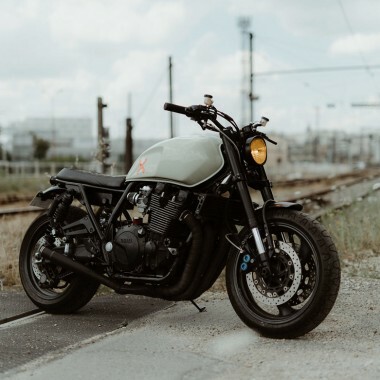 I wanted to build a café racer that wasn’t too radical….my other 500 falls into that class already, so something that could be ridden more comfortably was in order. 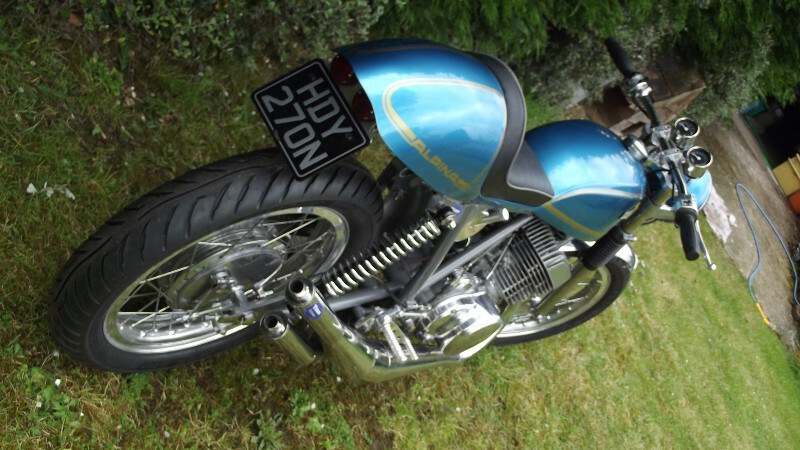 I also wanted the bike to be as modified as possible while still retaining its identity as a T500, which is why I chose to use the OEM tank and the maui blue paint. 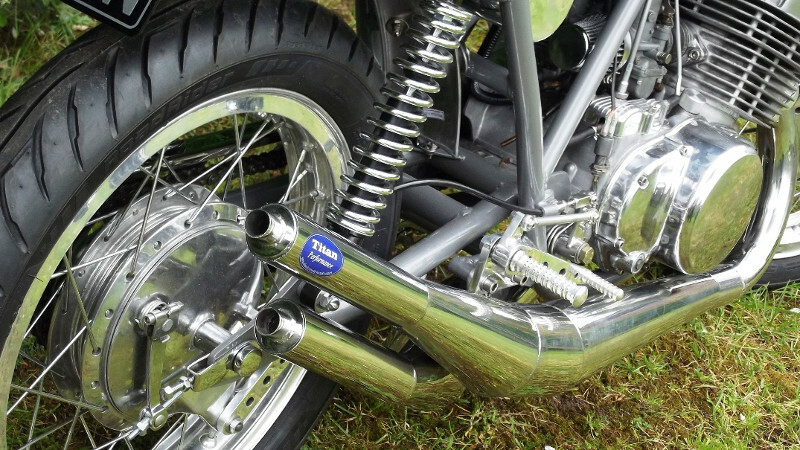 Back in the late 70s I purchased a set of chambers from a race guy, these pipes both ran along the right side of the bike, as his local circuit was mainly left handed. I still have them, but they were too rough for this new build, so I used the inspiration to build the set you see here. The frame has had the extra brace welded in as used on most racing 500s. I wasn’t looking for benefits in handling particularly, more a cosmetic improvement. The grey finish is powder coat. The forks are stock, but the generic stainless front fender is mounted and braced by a stainless bracket I designed and had waterjet cut. The rims are elderly Borrannis, that were used on a race bike in the 70s. I bought them in 1979 and had never used them. The hubs, drums and rims were all polished and laced with stainless spokes. The top yoke was also home designed and cut by waterjet before polishing. Smaller, neater instruments were mounted to another home designed stainless bracket. 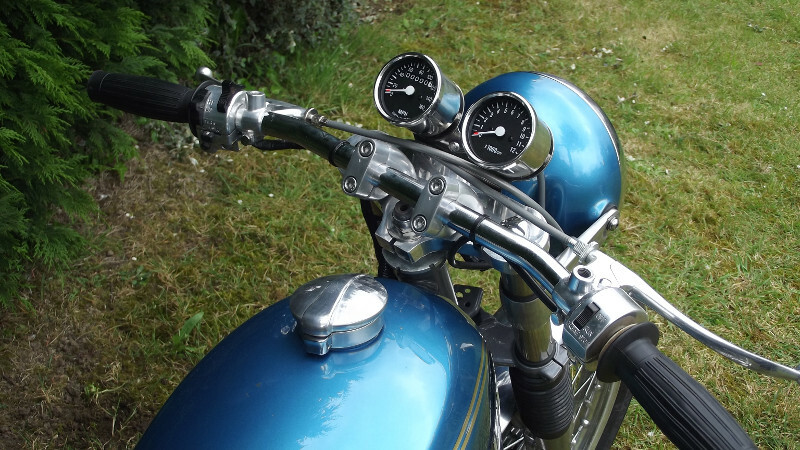 The Vincent flat bars are held by lovely Yamaha risers. The headlamp is an upgrade from a more modern GS500, and is mounted on alloy ears. The tank looks stock, but the OEM filler cap and fastenings were cut away to make way for beautiful 1.5” Monza cap. The seat unit is from our own mold, and the pad was made by a local upholsterer, fitted to my alloy pan. The battery, and electrical items such as reg/rec are housed in the seat hump. The oil tank hangs across the frame, and is another home designed item, made from polished ali. The idea was to tidy the centre of the bike by disposing of all the stuff that usually sits there, and give a lighter look to it, hence disposal of the airbox in favour of pod filters. The rearsets and torque arm are items we make and build, and which we sell on our website, and they are beautiful! The rearsets were slightly modified as there is no pipe on the left side of the bike to worry about. The pipes are designed by us, and all preparation up to the welding stage is also done by us. They are made from stainless, which has been mirror polished. TIG welding is a skill we don’t have, so this is farmed out to a local expert. It’s known as the Alpina…as a result of an Alpine tour taken in 1986. 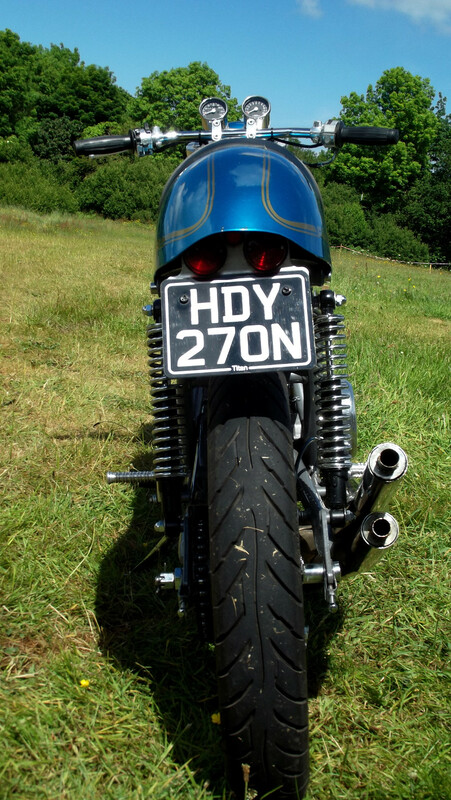 I think it’s closest to a café racer…. I would have to say the pipes…..everyone remarks on them. But to be honest, I’m chuffed with the whole thing! 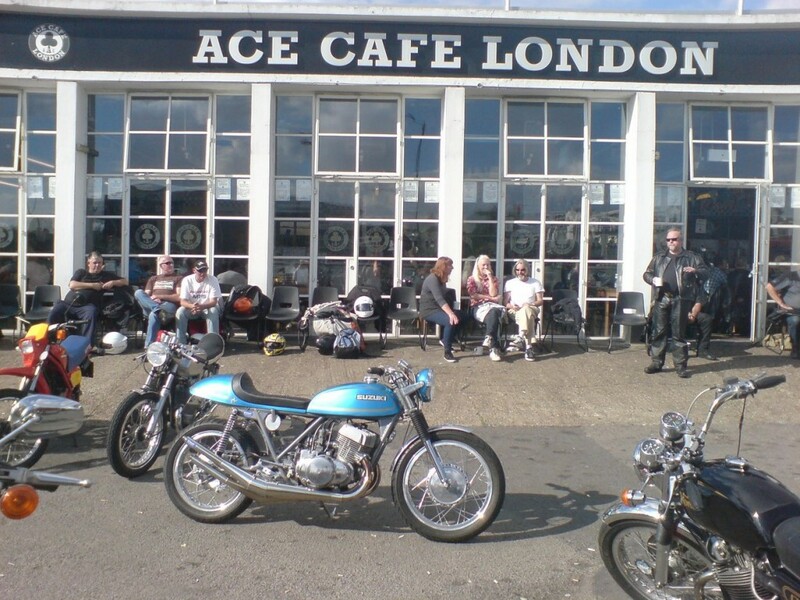 • We made the pilgrimage across the Pond to the Ace Cafe last fall — so awesome! I usually ride up to the Ace a couple of times during the year. 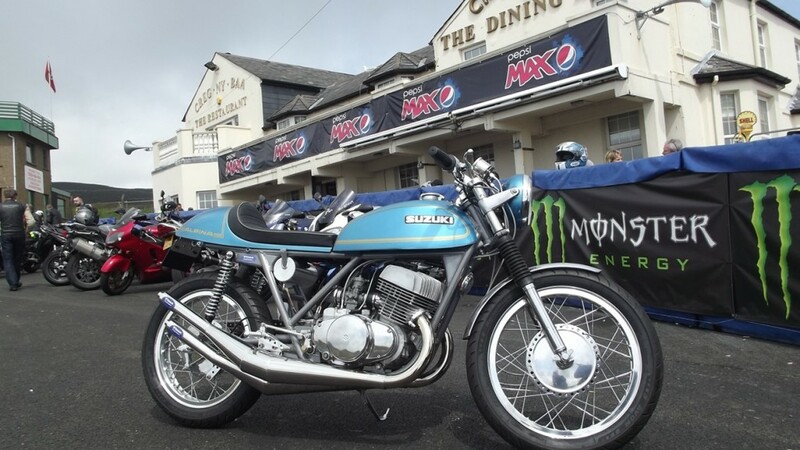 There’s literally an event there every day, so I pick a couple of relevant ones….classic Suzuki, vintage Japanese, or the two stroke specific Blue Haze day. The Ace is 100 miles from where I live, and involves riding through the centre of London. The 500 Alpina is always well received where ever I take it, I guess big strokers are becoming quite rare. Guys of my age mostly know what the bike is, and so many want to chat about it, telling me they had one, or their brother did…or their brother’s mate. 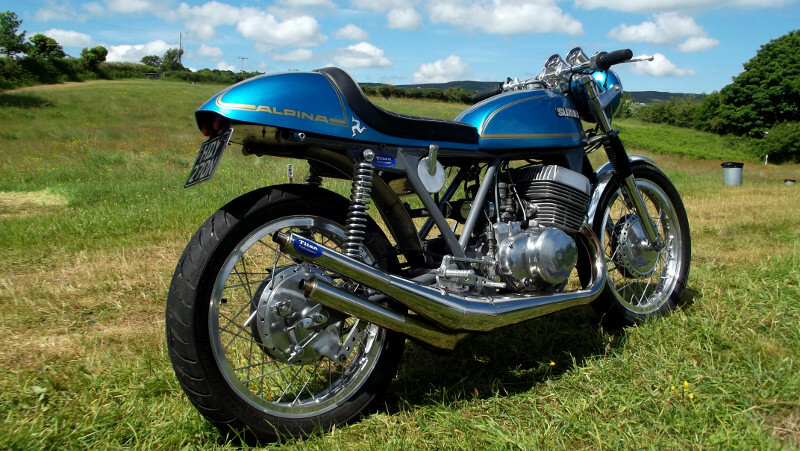 Younger guys don’t know what it is, and usually guess that it’s a 250, as since customising it, the bike has lost some bulk, and really looks very trim. If I had a £/$ for very picture that has been taken of it, I would be rich! Wonderful expression of the cafe racer’s art. 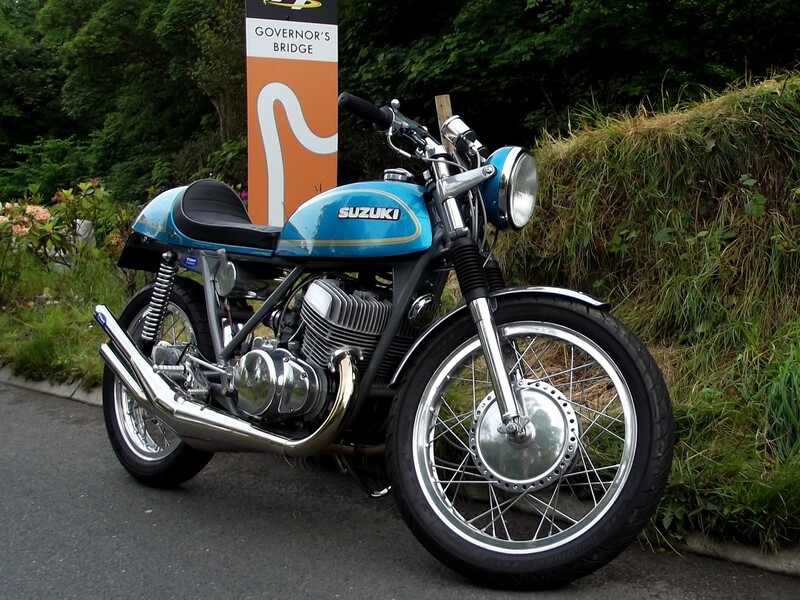 And not only was the T500 the best large 2 stroke of its time, it was the ONLY large 2 stroke of its time!